At 07:00am departure by (car, van or bus according to number of people) from your hotel in Manaus driving for about 04 hours. Lunch at the Pousada. The tour will start in the afternoon, by canoe exploring the river channel, piranha fishing and looking for river dolphins (grey and pink). Dinner. Night tour by canoe, searching for alligators (caimans), spear fishing, in the mean time listening to the fantastic night sound of the wetland while appreciating the starts. Back to the Pousada. Breakfast and afterwards departure by motorized canoe for a full day river tour. Exploring the inside of the wetlands. Spotting different variety of wildlife. Searching for a good place to catch different type of Amazonian fishes. Stop at local people house where the natives will show how to prepare a local food and enjoying a lunch with them. Visit to a manioc (Cassava) plantation and learning about the process of manioc. Visit to the rubber tree plantation. Stop along the river to see one of the interesting wetland Tree called KAPOK (SAMAUMA). According to season of high water level from February until begin of September it will be possible to access by short cut and navigate along big AMAZON River and even enter in the lake to see the famous Amazon water lilies (Vitoria Regia). On the way back appreciate the Amazon sun set. Dinner at the Pousada. Starting at 5:30 by Canoe for sunrise, bird watching and breakfast. Starting jungle walk for an instructive presentation of the fauna and flora. The guide will explain about Amazon medicinal plants and animals. Lunch at the Pousada and return to Manaus arriving about 5.00pm. 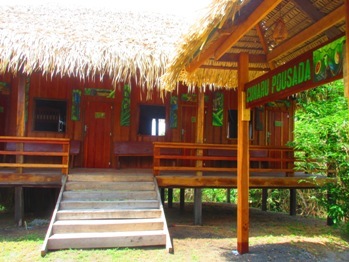 All meals during the tour, accommodation at Cumaru Pousada, all activities, native guide (English speaking), all transportation during the tour (boats/car/van/bus), mineral water is not included. It is provided filtered well water or it is possible to buy bottled mineral water. long-sleeved t-shirt or sweater, trousers, t-shirt, shorts, walking boots or trainers, raincoat, swim cloths, sun block, mosquito repellent, hat/cap, pocket knife, flashlight, a bottle for water as filtered water is supplied, possible to buy Bottled mineral water at the Pousada, binoculars if you have one.